FFA - Nike is launching a special branded Hijab. Hijabs are an oppressive symbol of Sharia law. Click here to send your email to voice concern to Nike about their plans to sell a special brand of Hijab. 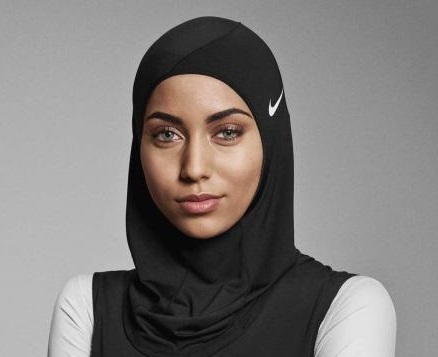 The Independent in the United Kingdom first reported: Nike is launching a high-performance hijab for Muslim athletes. The brand aims to inspire women and girls who face barriers in sport. The hijab, which lacks specific derivation from the Qur'an, is a symbol of oppression that is pushed by strict adherents of Sharia law. Sharia law is antithetical to the rights afforded under the United States Constitution. There is little debate online as to whether the Qu’ran mandates hijabs because it does not. Wearing a hijab is clearly driven by culture and custom and is not a religious requirement. However, Islamists who want to Islamize America instead of assimilate into American culture are pushing these Sharia style customs. Wearing the Hijab in Solidarity Perpetuates Oppression is the title of a column published on January 14, 2016 by The New York Times. The column was written by two Muslim women Asra Q. Nomani and Hala Arafa. The column states in part: In the eight times the word hijab, or a derivative, appears in the Koran, it means a “barrier” or “curtain,” with spiritual, not sartorial, meaning. Today, well-intentioned women are wearing headscarves in interfaith “solidarity.” But, to us, they stand on the wrong side of a lethal war of ideas that sexually objectifies women as vessels for honor and temptation, absolving men of personal responsibility. This purity culture covers, segregates, subordinates, silences, jails and kills women and girls around the world. Pew Research found that only forty three percent (43%) of American Muslim women wear hijabs. The majority of American Muslim women do NOT wear hijabs. Rasmieyh Abdelnabi, 27, grew up attending an Islamic school in Bridgeview, Ill., a tiny Arab enclave on Chicago's southwest side. It's a place where most Muslim women wear the hijab. Abdelnabi explains why she stopped wearing the hijab. She says that Islam teaches modesty — but wearing the hijab is taking it a step too far. "I've done my research, and I don't feel its foundation is from Islam," she says. "I think it comes from Arab culture." Clearly, Hijabs are an oppressive symbol of Sharia law. Florida Family Association has prepared an email for you to send to voice concern regarding Nike’s plans to sell a special brand of Hijab.